Sitting comfortably is an essential prerequisite for any drummer, both for ease of playing and injury avoidance. These thrones offer excellent support, bring a splash of colour and sharp design whilst being competitively priced. To date, the only thrones that Natal has manufactured have been perfectly comfortable, if a little sober in appearance. 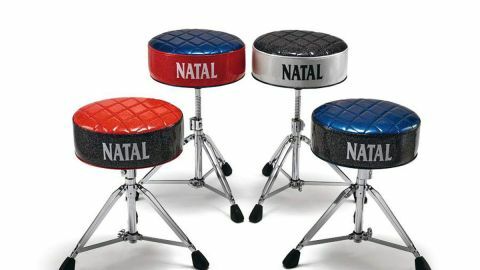 With a flourish worthy of a showman, Natal has revealed a more flamboyant approach with the launch of its Deluxe thrones. Bright and colourful, these seats are destined to bring a touch of pizzazz to the posterior. Fittingly, the Deluxe versions look and feel bigger than your average throne and measure 38cm in diameter while sitting a generous 14cm deep. Only one shape (round) is currently available, though there are four colour options - Blue/Black, Red/Black, Blue/Red and Black/White. In each case the first colour is found on the top of the throne while the second colour makes up the side panel. A further line of piping circles the bottom of each seat reflecting the top colour back. Diamond pattern stitching criss-crosses the top panel making a snazzy lattice effect, which is further enhanced by the presence of a sparkle within the material. And why not? Who said sparkle finishes should be restricted to drums? The heavy-duty tripod the thrones sit on comes from Natal’s standard series; with its double-braced legs and chunky rubber feet it feels extremely sturdy. Height adjustments are made by spinning the throne on the threaded rod and then clamping it tight with a quick release clasp. With such an ample depth of cushion we find that we have to swivel the throne down to its lowest tripod setting in order to get it at the right height for us (in fairness, we prefer an unusually low vantage point). Settling onto the seat for the first time we’re struck by the fact that our bones are completely ensconced within the circumference of the cushion and none of me is spilling over the edge.